Tomorrow marks the 40th anniversary of the death of Michael Dransfield who died on 20th April 1973. Last year Rochford Street Review published a series of articles and reprints of reviews on Dransfield as we felt that the approaching 40th anniversary of his death deserved acknowledgement – perhaps a new edition of some of his books for example. I did suggest to UQP that a facsimile edition of Street of the Long Voyage would be very popular…but alas today it appears that all of his work remains out of print. So to commemorate this date I am republishing a review I wrote of the Rodney Hall edited Collected Poems which first appeared in Southerly in 1988. Robert Adamson is organising a memorial reading/seminar to commemorate the 40th anniversary of Michael’s death – for further details please check the Michael Dransfield Appreciation Group on Facebook http://www.facebook.com/groups/6075328475/ – or keep checking back here as Rochford Street Review will be publishing details as soon as they are available. 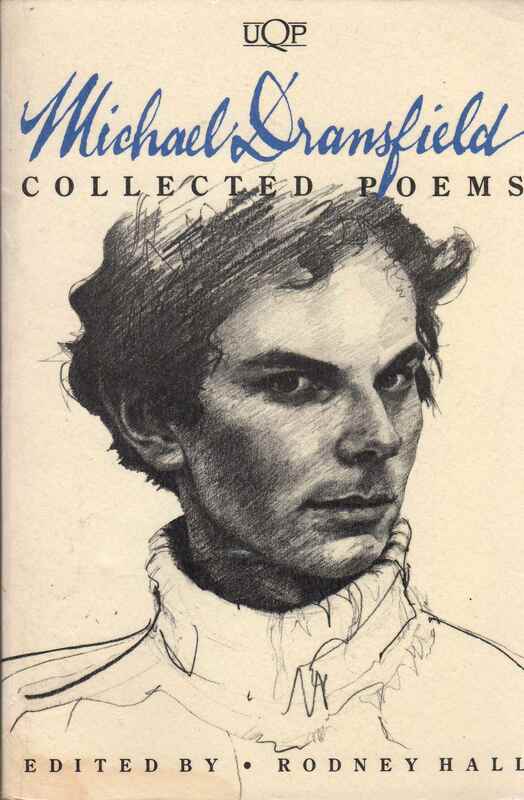 When Michael Dransfield died on Good Friday, 1973 at the age of 24 he had already published three collections of poetry and established a reputation as one of the most successful and popular of the new wave of young Australian poets who had emerged in the late 1960s. Since his death a further four collections have appeared, culminating in the Collected Poems (UQP 1987). When one considers Dransfield’s rapid rise to prominence, together with the attention focused on his lifestyle and the tragedy of his early death, it was almost inevitable that, to some extent, his life would come to overshadow his poetry. In fact, in the fifteen years since his death, the ‘Dransfield myth’, together with the decline in fashionably of the romanticism at the heart of much of his poetic imagery, has meant that his reputation as a poet has been attacked by a number of critics. In such a context, the publication in one volume of all of Dransfield’s published work, provides us with the opportunity to review his overall achievement and, hopefully, to reach a more realistic assessment of his work. One cannot begin to examine Dransfield’s career, however, without noting the important role Rodney Hall has played over the last twenty years in bringing Dransfield’s work to the poetry reading public. It was Hall, then poetry editor of The Australian, who first ‘discovered’ Dransfield’ in 1967. It was Hall who passed Dransfield’s work onto Tom Shapcott who was then putting together an anthology of contemporary Australian poetry for Sun Books which would eventually become Australian Poetry Now. Shapcott and Hall also helped Dransfield prepare his first two published collections, Streets of the Long Voyage (UQP 1970) and Inspector of Tides (UQP, 1972). While Hall encouraged Dransfield during his life, Dransfield’s death revealed the extent of Hall’s devotion to the younger poet. Hall took on the task of collecting all of Dransfield’s unpublished poems and prepared a selection for publication. The result were the two posthumous collections, Voyage into Solitude (UQP 1978) and The Second Month of Spring (UQP, 1980). Hall has organised the Collected Poems so that the volumes in which the poems first appeared are mostly kept intact. As a result the poems appear in rough chronological order beginning with Streets of the Long Voyage (containing poems written between 1964 and 1969), The Inspector of Tides (1968 to 1971), Drug Poems (1967 to 1971), Memoirs of a Velvet Urinal (poems from mid 1971), Voyage into Solitude (a posthumous collection of unpublished poems from 1967 to 1971) and The Second Month of Spring (poems from 1972). Not all these volumes, however, have been left intact. In the introduction Hall argues that where a poem has been published in more than one collection, he has chosen to leave it in the ‘large book’. As Hall believes that Drug Poems was an anthology of “pieces addressing a particular subject”, a number of poems that had previously appeared in Streets of the Long Voyage and Inspector of Tides, and others that would later appear in Memoirs of a Velvet Urinal, have been left out of the Drug Poems section in the Collect Poems. While Hall’s argument for this exclusion is, of course, perfectly reasonable, it means that the overall effect of the Drug Poems section in the Collected Poems is reduced. This overall richness of imagery, achieved by selective use of language and a careful juxtaposition of individual images, is one of Dransfield’s great strength in these first two books. One can recall numerous poems where he achieves it – ‘Chris’, “Surreptitious as Desdemona’, ‘Linear B’, ‘Death of Salvatore Quasimodo’, ‘Bum’s Rush’, ‘Ground Zero’, ‘Geography’, ‘Loft’ and ‘Inspector of Tides’ among others. While Dransfield, of course, was not the only one of his contemporaries to achieve this, the ease with which he achieved it again and again in these first two books, both of which were published before he was 22, is an indication of just how early he matured as a poet. Dransfield was a self-declared romantic and the richness and delicacy of his imagery was an important part of his romanticism. The poems in his first two books are filled with what might be called clichéd romantic symbols – magic carpets, crystal wine glasses, Greek mythology, Vincent van Gough, ruined mansions , fallen aristocrats, candles and dukes. But Dransfield’s romanticism was not confined to his poetry. He increasingly attempted to live the romantic image of the ‘suffering’ artist cut off from mainstream society because of his/her sensitivity. This can, perhaps, be best seen in his drug poetry. Streets of the Long Voyage, The Inspector of Tides and Drug Poems contain some very powerful and moving drug poetry. ‘Bum’s Rush’, for example, is one of Dransfield’s best poems. But as his addiction deepened, drug related imagery began to dominate his poetry more and more. The inference here is clear, poets and junkies are really two sides of the same coin. This sense of the suffering individual artist/drug user, while clearly growing out of the milieu of the late 1960’s, has come, in time, to represent the less successful aspects of Dransfield’s romanticism. On the acknowledgement page of the original Sun Books edition of Drug Poems, Dransfield states that a number of the poems “will appear in Memories of a Velvet Urinal to be published in the USA in 1972.” This was an overly optimistic note. According to Hall, Geoffrey Dutton had promised to take the manuscript with him to the US but, as it turned out, it was not accepted for publication. Memories of a Velvet Urinal was, in fact, to remain in a number of different manuscript forms until Maximus Books in a Adelaide published a version in 1975. Hall argues, and the evidence would appear to support him, that this actually represents a separate concrete poem and not a title. At this point I would have appreciated a further note of explanation from Hall concerning the transfer of the title “To the great presidents” from one poem to another. The Collected Poems version also rearranges the order of the poems so that the book is now divided into four sections. This is, in fact, the most important change as it brings Memoirs of a Velvet Urinal into line with both Streets of the Long Voyage and The Inspector of Tides, both of which were divided into sections. The Maximus edition has the feeling of almost being thrown together. It begins with ‘Epitaph with two quotations’, a poem which is physically difficult to read and one of the weaker poems in the book. The Collected Poems version, on the other hand, opens with the title poem, ‘Memoirs of a velvet urinal’, a striking poem about a homosexual encounter. Dransfield, by regrouping the collection, and rejecting a number of poems, has tightened the book considerably. Whereas it was quite easy to believe after reading the Maximus edition that all the poems had been written in the four-month period between May and August 1971 (which, in fact they had), the Collected Poems version has a much more crafted and professional feel to it. led you away to a place you cannot identify. spain? It’s difficult to escape the feeling that Dransfield could still have done more to the manuscript of Memoirs of a Velvet Urinal. The evidence suggests that, in the face of a number of publishers’ rejections, this editorial process was well underway at the time of his death. If he had lived, Memoirs of a Velvet Urinal, in time, may have been shaped into a volume which surpassed the achievement of his first two books. Voyage into Solitude is the first of two collections of unpublished work which Rodney Hall edited after Dransfield’s death. In this first collection Hall assembled his selection from the period 1967 to 1971. In effect this represents the material that Dransfield, and those who helped him, rejected when editing material for those books he did publish during his life. Overall it is probably fair to say that Voyage into Solitude is a tribute to the editorial process which went into the first four books. There are only a few poems in this collection which I would have been prepared to argue for. These would include ‘Sonnet’, ‘The sun but not our children’ and the wonderfully descriptive ‘Pioneer Lane’. For the most part, however, it is easy to see why these poems were left out. Many seem incomplete, an image doesn’t work properly or, as is more common, is too clichéd to be effective. Though it was obviously important for Hall to collect and publish these “rejected” poems, in the context of the Collected Poems, Voyage into Solitude remains a book primarily for the Dransfield scholar or enthusiast. Dransfield stopped referring to his work as poems during this final period, preferring to call them raves. In effect the work in The Second Month of Spring can be likened to the final explosion of light a star gives off as it starts to collapse in upon itself. These last poems are, in fact, intensely personal, almost to the point of being a diary in verse. While this is not great poetry, it is difficult not to be moved by the extremes of emotion – anger, hope, resignation – and, at times, the intense physical pain, which these poems highlight. Rodney Hall, in his introduction to Voyage into Solitude, made the point that Dransfield is one of the few Australian poets to ever have “a genuine popular following….among people who do not otherwise read poetry”. The sheer size and scope of the Collected Poems, I believe, illustrates why Dransfield was able to build up this following. Dransfield may have felt that being a poet in Australia was “the ultimate committment”, but there is no doubt that the late 60s were an exciting time to be a young poet in Australia. While most of his contemporaries saw themselves as “modern” poets, breaking the hold of the conservatives on Australian poetry, Dransfield was reading the romantics as well as contemporary American and European poetry. Though critics may disapprove of Dransfield’s romanticism, there is little doubt that, during the late 60s, it tapped a feeling among young people and, as a result, can be said to lie behind much of Dransfield’s initial popularity. Perhaps, in the final instance, Dransfield’s greatest strength can be seen in the development we can trace in the Collected Poems from the early, richly romantic poems, through to the more hard-edged poems of Memoirs of a Velvet Urinal. Sadly, his tragic death in 1973 cut short this development. We should be grateful to Rodney Hall for editing this collection because, if nothing else, it has helped focus attention back towards the poems and away from the “Dransfield myth” which has come to dominate his reputation since his death. A quick search of the UQP website suggests that there are no Dransfield books currently available (even the John Kinsella Selected Poems is “currently unavailable for purchase”). This entry was posted in Issue 7, Mark Roberts, Michael Dransfield, Michael Dransfield Collected Poems, UQP and tagged Australian Literature, Australian poetry, australian poets, literature, Robert Adamson by Mark Roberts. Bookmark the permalink. This is one of the best reviews of Dransfield’s Collected Poems, maybe the best review, it opened the way to new readings, and can still do so.